The scale has finally made me one happy girl today! I am finally in the 130's again (139.8 lbs to be exact!) and I couldn't be happier. Well, maybe if I was in the 120's lol, but that day will come soon enough. One packet at a time as they say! One of the reasons why I may be losing now is because I got my blood work checked and my doctor informed me that my thyroid medication needed to be increased. I haven't check my thyroid levels in awhile now and I am wondering how long my thyroid needed the extra dosage. Who knows? What is important is that I know now. Well, today is my second day being on my new dosage and in the one day, I have already noticed a difference in my energy levels. I was always tired before and now I feel great. Not to mention I lost 0.8 lbs in one day after changing my medicine. I know it is still early to tell, but I hope the change will help my weight loss. I highly recommend getting your thyroid levels checked regularly while on Medifast because my thyroid levels stayed the same for over 7 yrs and just now it changed once I began losing weight. You would think that the more weight you lose, the less thyroid medication you would need, but not with me! So get your thyroid levels checked regularly! I found this recipe at www.skinnytaste.com. Gina has a lot of Weight Watchers friendly recipes on her site but she also has a section for low carb recipes. You may have to sift through some of the low carb recipes and do a few adaptions to make them Medifast friendly but her site is still worth taking a look at if you are on Medifast or just trying to watch your waist line. This particular recipe was actually called Thai Coconut Curry Shrimp but I wanted to try it with chicken. It would work with either types of meat. For some reason, I was thinking the coconut milk would make the meat sweet, but it wasn't sweet at all. I really didn't taste much of the coconut flavor. Maybe because when I think of coconut, I think of the sweetened shredded kind I used to love to eat sprinkled on cakes, cupcakes and pies! Yummy! I guess I could have sweetened up with Splenda, but I realized it tasted fine without any. I did add a little bit of salt which I used about half of a 1/8 tsp. I will definitely be making this recipe again. It's a nice change if you are craving some ethnic Thai food. Complete your meal with cauliflower "rice" which is basically cooked and grated cauliflower. You won't even miss real rice and you won't be consuming all the carbs! 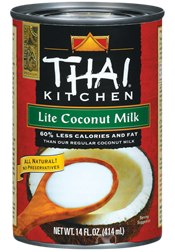 This is the coconut milk I used. Make sure you get "Lite". It is only 1 carb for 1/3 cup! I always thought coconut milk would have mucho carbs but nope, not at all! This is a small jar found in the Ethnic section of the grocery store. It is only 1 carb for 1 tbsp which is not bad at all! It is made of lemongrass, ginger, red chilies, and other spices. 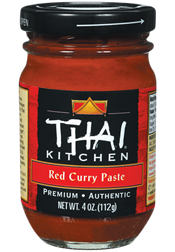 You can use this as a marinade, stir fry, soup base or use it with coconut milk to make Thai curry. Fish sauce of course is derived from fish that has been allowed to ferment. It is essential in making curries and other sauces. I really don't think it tastes fishy, despite the name. It kind of reminds me of a soy sauce. I get mine at a local Asian store, but they may sell it in the grocery store. I use the Squid brand because my Mom has been using this brand since I can remember. It was always in my Mom's house! It is definitely a staple in the Thai household. Spray a large nonstick skillet with cooking spray. Over medium high heat. Add scallion whites, garlic, and red curry paste and saute one minute. Add cubed chicken and salt cooking until almost done. Add coconut milk and fish sauce; mix well. Simmer about 2-3 minutes. Remove from heat, mix in scallion greens and cilantro. Serve over cauliflower rice.